This is a series of articles celebrating our volunteers and all the work they do for, and with, Historic Rugby! The Autumn Decorating Group volunteers have included, over the years; Rita Myers, Ron and Bethany Jackson, Barbara Mitchell, Cheryl Hodgkins, Carman Roberson, Lisa Donegan and many others. 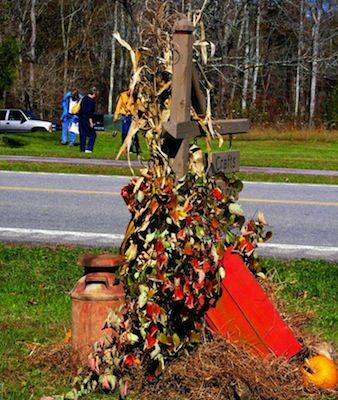 We thank each of them for helping put together the gorgeous autumn displays throughout our village! Mmmmm… crisper air, blue skies, the trees turning bright colors and the smell of wood burning fireplaces-what does that mean in Rugby? It means the volunteers who transform Rugby as the seasons change are about to get out and do their work! And, love it they do! The villagers always enjoy this time of year when they can watch a marvel of sorts take place as a pick-up truck, loaded to the gills with materials and volunteers, starts making its way from site to site throughout town, and folks loaded down with goodies bound out and, in what seems like just a few moments, magically arrange a complete autumn display before everyone’s eyes! This is done over and over until everything from the signs entering the village to the Visitor Centre, Kingstone Lisle, the Community Building, the front gate to the Church, the Commissary, the Harrow Road Café, Newbury House Bed and Breakfast and Uffington House have all been transformed! A lot of hard work takes place before the displays are put together. 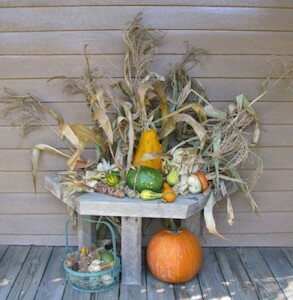 Using the natural beauty of Rugby as inspiration, the volunteers tend to use as many purely natural decorations as possible including corn shocks, cattails, mums, gourds, and pumpkins. These are bought at various places, including the dairy farm off of Hwy. 127 in Grimsley where Danny sold them pumpkins in bulk at a good price last year. They have also gotten donated mums from Bob Washburn at Wolf River Nursery in the recent past. We thank these folks for working with us! It should be noted that the volunteers depend on donations to purchase the fall items, so if you would like to make a donation to this project, or to volunteer to help, please contact Amy Barnes at rugbylegacy@highland.net or 423-628-2441. The volunteers then go out and gather other ‘naturals’ including grapevines, dogwood limbs with berries, and sumac limbs, as well as flowers and dried items from their gardens, the roadsides and the woods. 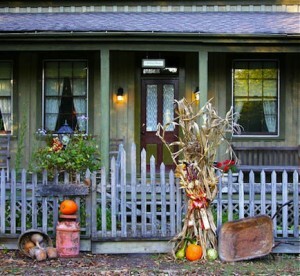 At home they gather together favorite items to be used as props-everything from bushel baskets, rusty old wheelbarrows, milk cans, goat wagons, graniteware, kettles, coffee pots, clay pots, almost anything that will add interest to the vignettes. Sometimes they make special objects for the displays such as birdhouses or homemade scarecrows. So, for those of you looking around for props you can use remember what Lisa and Carman say: almost anything you can make, borrow, re-use and just re-purpose for the sake of creativity are items that can be used as decorations! used on the corn shocks are usually of a coated variety so they will withstand the weather. Some arrangements are put in water, and the mums have to be watered. The tree branches are generally just freshened up by adding new foliage throughout the season- otherwise, it’s impossible to keep things fresh over the lengthy autumn season. A few dried, curled leaves are an appropriate ‘look’ for the season, and sumac is something that doesn’t need hydration because the drier the berries, the better they look. 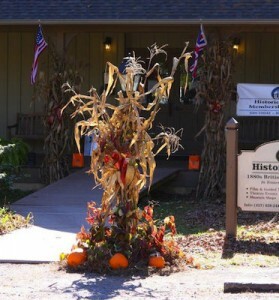 Remember as you tour the village during autumn that the beautiful displays you see include not only those made by our volunteers, but by our homeowners’ and storekeepers’ as well! As you drive through Beacon Hill and the other sections of town you will see many homes and stores bursting with creative and inspiring fall décor. It’s no wonder that this time of year is one of Rugby’s most popular with such a palette of festive vignettes sprinkled around town waiting to be photographed and enjoyed!! If you would like to volunteer for Historic Rugby please go to the Volunteering page and fill out the volunteer questionnare. You can also contact us directly for more information!